Mango Pub. Group, 9781633537101, 352pp. Exercise is not optional: You don't have to run a marathon to be fit and healthy or suffer through a triathlon that includes a half-mile swim in the ocean. But you do need an exercise habit. Especially as we age, exercise is not optional. Yet unless we had been athletes as kids or young adults, and few of us were, we do not know how to find our edge. Learning how to carve out time to meet our fitness needs or to push ourselves physically and mentally is one of the greatest challenges to aging well. 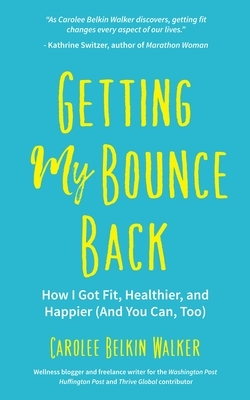 Finding the inspiration to exercise: Inspired by her highly popular blog "Be the Dog," Carolee Belkin Walker's Getting My Bounce Back is a relatable story of what it's like to be a successful professional woman encountering all things fitness for the first time. Even if readers have never put on a pair of running shoes or tried again and again to get a fitness habit, they'll relate to the highs and lows of Walker's journey to the back of the pack and ultimately stumbling on a path to resilience and well-being. Happier more confident woman: You could fit two of Walker inside what her body looked like in February 2014. But it is the powerful sense of confidence and resilience that's had the greatest impact on Walker and inspires others. This book is about Walker digging in, discovering who she is, and seeing how far she can push herself to be strong, fit, healthy, and most important, resilient. Her writing is full of humorous situations as she decides to be an active participant in life and not take the setbacks, or herself, too seriously.